I’ve never described a film as rustic, but for the film, it’s appropriate. “The Wonders” is also simple, unflattering and straightforward, yet interesting and compelling. 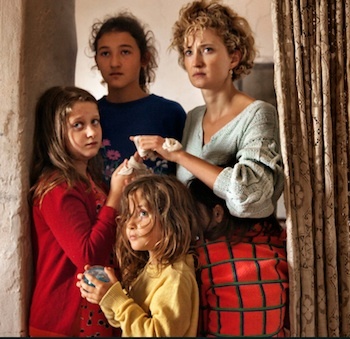 It is a story about a family of beekeepers who live in the Italian countryside. The family consists of several children, a harsh father and a somewhat sympathetic mother. At the center of the family and story is the eldest daughter, 12-year-old Gelsomina who is strong and determined and practically runs the household. Overall, they lead a simple life in which all are consumed with their tasks of beekeeping and making honey. Their world is disrupted at the arrival of a troubled teen boy, and encroaching commercial marketing. Gelsomina embraces both intrusions, but the father resists on the latter. The filmmaker gives an unbiased portrayal of the family’s conflicts. She also is more concerned with characters and ideals than beautiful landscapes and a strong, traditional plot. The performances are very naturalistic and engaging, with Maria Alexandra Lungu as Gelsomina stealing the show.